For the last year, Nokia has been the poster child for Windows Phone but recently HTC and Samsung have seemed more in favour. 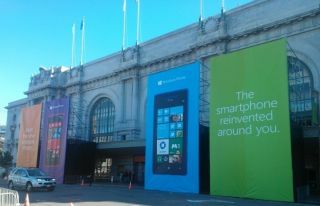 Samsung announced their Windows Phone 8 handsets first and the HTC 8x was handed out to enthusiasts at the Windows Phone 8 launch. We asked corporate vice president of the Windows Phone Division Terry Myerson to explain how Microsoft juggles partnerships with rival phone makers and how much influence manufacturers have on the design of Windows Phone. "We work in different ways with each of them on the engineering and on the marketing," Myerson told TechRadar. Nokia gets priority when it comes to development because of the commitment it's made to Windows Phone; "Nokia is exclusive to Windows Phone and we definitely, on the engineering side, prioritise platform work to support their differentiation coming through." Despite the restrictions it puts on handset specs, Microsoft doesn't want to see the same handset from every phone maker. "Our goal is that Windows Phone is a platform that our partner differentiation can shine through on. We do spend time planning with HTC and Samsung, sitting down with them and collaborating on what a product is where their differentiation elegantly coexists with Windows Phone and what we bring. There are different cultures to each of these companies and they all have their own plans for how they want to bring their technologies to market." He's predictably enthusiastic about the handsets that come out of the collaboration with all three partners. "I think the result is the most fantastic killer hardware we've ever had, not only for the windows ecosystem - I think these devices are better than any device - well, I they're the best devices. They're colourful, they're beautiful, they're thin, amazing cameras…"
Some of what you see in Windows Phone 8 handsets is Microsoft's idea, some comes from the OEMs. "In the case of wireless charging, that was definitely Nokia's initiative to say they wanted that; they had technologies inside their labs, they took the initiative to put forward a number of engineering designs. There were definitely platform modifications we made to support their innovation but Nokia led on that. All the credit goes to them." "The Wallet feature is a place where the Windows Phone team thought about how to use NFC. Roaming content though SkyDrive, encryption; these are all features coming from Microsoft. But the wide angle camera that HTC did with Skype in mind, Nokia's wireless charging - those are innovations coming from our hardware partners." Although app developers get far more access to the platform in Windows Phone 8, Microsoft is still keeping some control and treading a fine line between the free for all of Android that Google is increasingly trying to rein in and the central control of the Apple ecosystem. "We like to think of it as the structured ecosystem that allows the differentiation of partners to shine though on our platform, at the same time providing consumers the confidence that we will protect their privacy, keep malware off the platform, provide a consistently familiar user experience, and providing developers confidence they can write apps once and target our platforms. So there is more structure and structure at times can feel constraining but also there are benefits to it. It's helpful that everyone drives on the same side of the road, for example..."
Why was the SDK so hard to get? Myerson is unapologetic about not making the Windows Phone 8 SDK widely available before the launch (when most developers didn't have phones to work with) and concentrating instead of key developers to get big-name apps; 46 of the top-selling 50 apps from other phones will be on Windows Phone 8 (and yes, he knows who the missing four are and is working on changing their minds).